It is the 29th of July 2011 and day 75 of our Cross Canada and Back Trip. Today we are driving to Parc National du Canada Forillon or in English, Forillon National Park of Canada in the province of Quèbec. It takes us about 1.5 hrs to drive there around the Baie de Gaspé. The weather is overcast but warm. We stopped in at the Parc Information Center. There was no boutique here just information, on the south side in Penouille. As we drive on toward the southern tip, one can see that there were fishing villages along the way. Some of these fishing villages are still active and outside the park, others are abandoned, and one is a museum, like the National Heritage Side Grande-Grave. We have arrived at the end of the road and have to go on foot from here on. The trail leading in, used to be a road called Boulevard de Grande Grave, but is now mostly a hiking trail, and the road is just used for park employees. The walk is about 4-5 km each way on mostly pretty good trails. We check our back packs and strap them on, with bear spray attached on our hips. We were stopped at the park gate and were told to watch out for black bears. 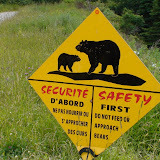 There are lots of signs warning that we are in bear country. You are in Bear country. Be aware. The walk through the park is wonderful through forest, along the coast high above the water, through old meadows, and an almost dead forest. By the time we are arriving at the tip of the peninsula at the light house, we have worked up an appetite for some lunch. Our sandwiches taste so good. Cape Gaspe light house in the back ground. After lunch we take a small trail down towards the water hoping to spot some whales. No luck this time, but there are plenty of shore birds. On the way back we take a different route, a small gravel trail. Two cyclist stopped and warned us about a black bear ahead. Sure enough - up ahead there is nice looking black bear, probably 2-3 years old foraging for berries and other food along the trail and bushes. There is plenty to eat in the park for the black bear. Liz is running the movie camera while I have my pepper spray ready, just in case. The bear takes one look at us, and mumbles to himself: "those guys are ugly, better leave" and promptly disappears into the under-brush. We continue our hike toward the entrance, and we are warning the in-bound hikers as we meet them. We also tell the park warden on our way out, and show her our pictures and movie of the bear. "Pay attention to the bear's behaviour and adapt accordingly. And in any case, stay calm, avoid making sudden movements and keep your children by your side. If the bear hasn't noticed you yet, make some sounds to avoid taking it by surprise. Then, back up slowly, making sure the bear still has a clear path to get away. In most cases, the bear will run off. If a bear does attack - something that happens only very rarely - defend your self! The idea is to impress the bear, to look strong and ferocious! Raising your voice, grabbing a branch or stick and waving it so you look bigger are all good solutions." Almost back at the truck in the Cape Gaspe parking lot. We drive slowly back to camp taking in the incredible scenery and views. We can even see Percé Rock / Rocher Percé in the distance. This was another fantastic day. For more pictures from Forillon National Park, click on the image below or go directly to the slide show here.